LinkedIn is introducing two new features that will make the product more functional for its users. 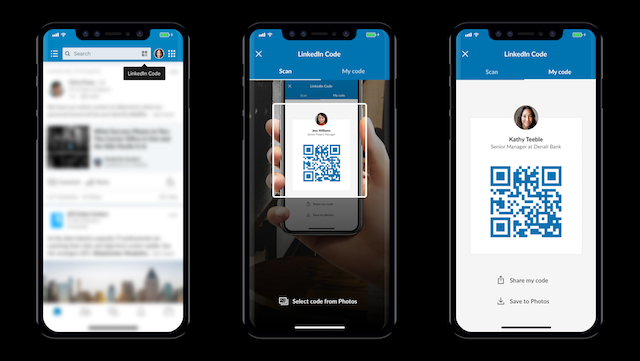 First, LinkedIn will now let you connect through QR codes. In the LinkedIn app, tap the QR code icon in the Home tab's search bar, and there you'll see a QR scanner as well as your own code. Scanning others' codes or uploading an image of one from your phone will take you to that user's profile and you can share your own code through messaging apps and email or add them to websites, email signatures, your resume or event materials like brochures, badges and lanyards. Secondly, LinkedIn is incorporating a "See Translation" button on posts within the LinkedIn Feed, the recent activity section on a user's profile and a post detail pages. The translation is powered by Microsoft Text Analytics API, which also provides translations for Bing, Skype, Office and Twitter, and is available for more than 60 languages. Since purchasing LinkedIn in 2016, Microsoft has worked to incorporate it into its other products. The company has released a LinkedIn-powered Resume Assistant for Office 365 subscribers, incorporated LinkedIn details into Outlook.com and added a feature to its AI-powered Pix camera app that lets users find a person's LinkedIn profile through a snapshot of their physical business card. The QR codes are available now for iOS and Android. The translation feature is available on the desktop and mobile web versions of LinkedIn and will roll out to iOS and Android apps in coming weeks.